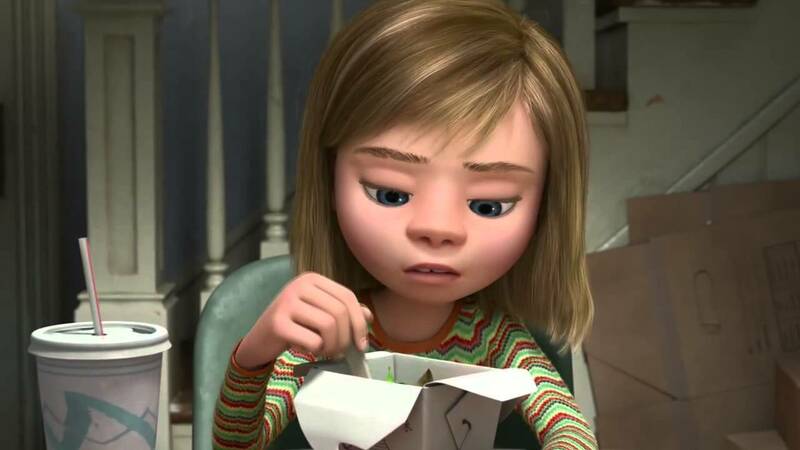 There's been so much hoopla about Inside Out in the past week, people going and screaming about how good it is, how much they loved it, and how needs to see it right away. And, I'll be honest, my general internal reaction that kind of response tends to be the opposite of helpful. I sort of shrivel inside and go, "Well, if other people like it then I guess we should watch it. But we don't want to watch it because other people like it. We are a unique and special sunflower and cannot be tamed. You don't know me, Pixar!" And so on. It's kind of embarrassing to admit, but a lot of the time I am held back from enjoying things simply by my own stubbornness. I really like being a special snowflake, and finding out that everyone and their brother loves something is like the surest way to make it so that I resent the thing for making me happy. I'm messed up. I'm working on it. 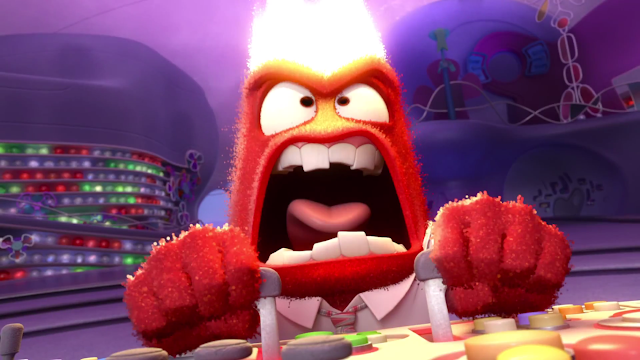 Anyway, the point here is that I didn't really want to go see Inside Out yesterday, but I did it anyway, and I'm really glad I did. It's a genuinely good movie that does pretty much everything I could ask a film to do. It's got a cool female protagonist with a lot of layers and complexity and depth, a really neat concept, and a really important message about emotional health that I don't think enough people talk about. 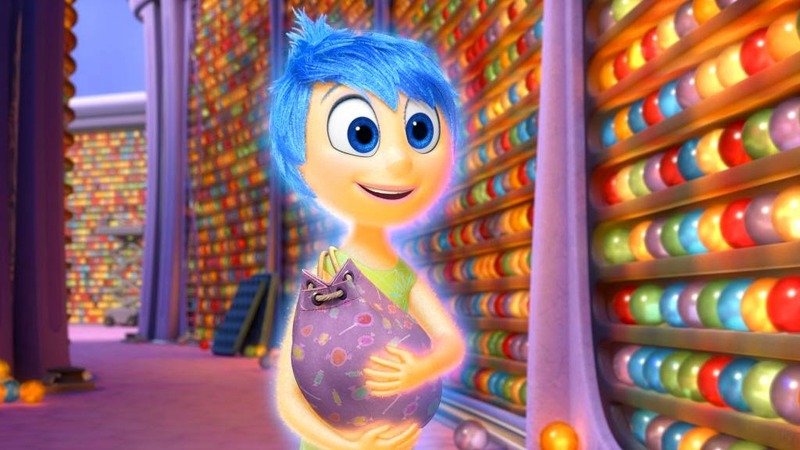 So, if we're just going for the quick take here, yeah, you should totally see Inside Out. It's really good. 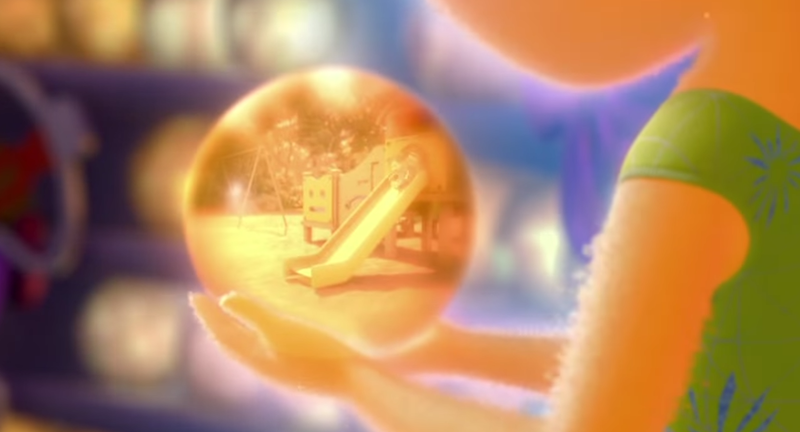 It's not my favorite Pixar movie, no, because Wall-E is still the movie that came the closest to making me not afraid of robots,*but it's a really amazing film and you're probably going to love it. It's the rare movie where I don't think I actually have anything bad to say about it. Seriously. I have no complaints? I feel weird. 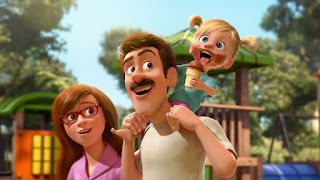 The longer take is that I was really pleasantly surprised by how good this movie was in part because I have kind of low expectations of Pixar these days. I know that sounds cynical and horrible, but hear me out. First off, the trailer looked awful. I had no interest in this movie based on the trailer. But second, Pixar has seemed lately to be falling into the sequel trap. The world of Cars and Cars 2 and really marketable franchises. Given that abhor the Cars movies, and they drive me nuts,** it's not hard to see why the past few years haven't given me much to root for in Pixar films. 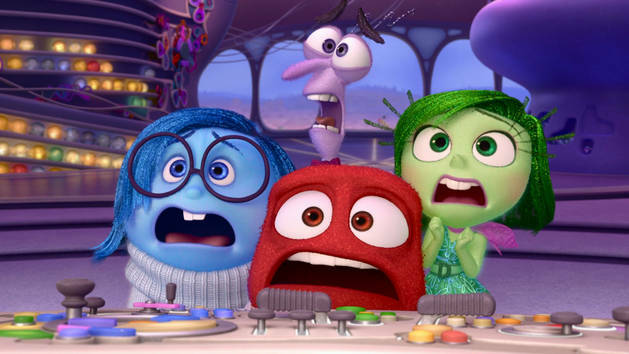 Besides, sad to say that this film is only the second Pixar movie to ever have a female protagonist, and we still don't have one about a person of color. But, honestly? My complaining stops there. Riley (Kaitlyn Dias) is a sweet young girl who adores her two parents (voiced by Diane Lane and Kyle MacLachlan) and they adore her. She's great at hockey, really goofy, a great friend, and generally an awesome person. She is made this way largely by her emotions. Chief among them is Joy (Amy Poehler), but her other major feelings get their voices heard too: there's Disgust (Mindy Kaling), Fear (Bill Hader), and Anger (Lewis Black), all emotions that, while negative, serve to keep Riley safe. And then there's also Sadness (Phyllis Smith), who doesn't seem to serve any real purpose at all except for bringing everybody down. Joy runs a tight ship in Riley's brain, but her job gets a lot harder when the family suddenly moves from Minnesota to San Francisco. It seems like in this move absolutely nothing goes right. First their stuff gets lost when the moving van takes a wrong turn to Texas, then the new home is gross, and she misses her friends, and her dad is always busy and stressed because of his new job, etc. Nothing is good and fun and happy! What will they do! Of course Joy figures that the best possible solution is to find the good in everything, but eventually, despite all the restrictions Joy puts on her, Sadness gets out and makes Riley, well, sad. And then in her attempts to corral Sadness and get her to go away, Joy accidentally gets herself, Sadness, and all of Riley's core memories, the things that make her who she is, dumped out of the control room and into the recesses of Riley's mind. The rest of the film alternates between the control room/headquarters, where Disgust, Anger, and Fear are trying desperately to help Riley through her life without blowing it up, while Joy and Sadness try to get back. But they can't. There are very few ways back to headquarters, and since Joy refuses to listen to anything Sadness says, it takes a lot longer than it needs to. 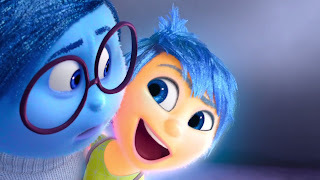 It's pretty clear from the beginning of the film that this movie is going to be about Joy learning the value in Sadness, but I was pleasantly pleased with how they do it. Basically, and I'm really skipping past the majority of the plot here, Joy has to come to understand the value in being sad. First it comes when they encounter Riley's forgotten imaginary friend, Bing Bong (Richard Kind), who is sad and needs to cry with sadness for a minute before he feels better. But later it comes when Joy realizes that a lot of Riley's happiest memories come right after she's been sad and then her sadness helped other people rally around her and make her feel better. In other words, Joy has to learn that sometimes we need to be sad, if only to allow ourselves to reach out genuinely and show other people we're hurting. Sadness isn't a curse or a useless emotion, but rather a vital one. When you're in touch with your sadness, yes, you have more down moments. You cry more. But you also have a much greater ability to empathize with others. You can have deeper relationships. You can actually accept the sorrow around you without having to deny it or repress it. In other words, being sad is just as vital to your emotional health as being happy. To ignore that is to ignore a huge chunk of what makes you who you are. And that, as it turns out, is the whole point of the movie. The reason that everything got so messed up in the first place is that Joy was refusing to let Sadness, or really any of the other emotions, have a say in what Riley did or who she was. By doing that, yeah, she made sure that Riley was a happy kid, but she also made it so that Riley had no real depth of character or inner reserves to call on. She was just happy. And happy is good, don't get me wrong, but it's not the sole explanation of what makes a person. Your pain demands to be felt. It's something I've definitely said to people before, and I did not come up with it myself. It just is. It's true. Pain is important and needs to be acknowledged. It's there for a reason, to tell you that something is wrong. To deny it is to deny that there's anything causing it, and that means letting things fester in your subconscious or your heart or your whatever for far too long. I think a big part of the genius of this movie, though, is not so much the theme and the meaning of it, but rather the audience. See, I've seen movies about the importance of acknowledging your pain before, but never for kids. Or at least, no movies about that that I can think of off the top of my head. Lilo and Stitch? Anyway, kids movies don't tend to deal with this topic, and it's even more rare for a movie about a preteen girl to deal with this. Women are expected to just know innately how to handle our emotions, while men are expected to just stuff them down and never think about them at all. Neither of those stereotypes is helpful. They're both recipes for badness. But even more, it's not really seen as okay to be a woman who is sad. If you are, society tends to see you as someone who needs to be "fixed." Sadness is terrible, right? It brings everyone else down! Knock it off! Women aren't supposed to be sad because we're not supposed to admit that there's anything in our lives worth being sad about. Unless it's a romantic relationship. But even then there's a very definite timeline of acceptable sadness and it cuts off pretty quick. 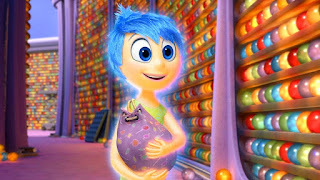 So having the protagonist of a film about acknowledging the importance of sadness be a girl is really great. Just really really great. And having it be about a goofy girl who loves playing hockey and also likes fashion and is maybe just getting interested in boys but not quite and who has all of these layers and complexities is even better. Riley is compelling not just because we know what's going on in her head, but because she is a much better rounded human being than we usually get. And I appreciate that. 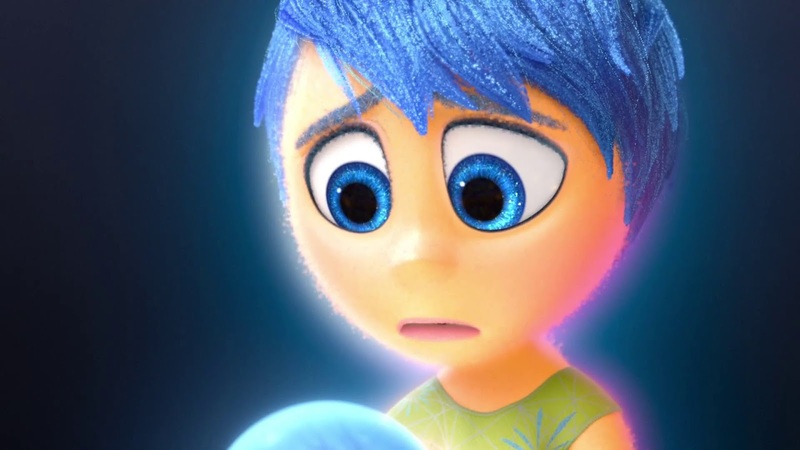 Going back to the sadness thing, though, I think one of the biggest resonances in this film for me was actually about how letting yourself feel sad makes you more capable of helping others and reaching out to them. Sadness is able to minister to Bing Bong in a way that Joy can't because Sadness acknowledges his pain. She can empathize. Joy only wants him to cheer up, but Sadness sits with him and tells him it's okay to be hurt and she's sorry the bad things happened. Sadness is necessary if we want to view other people as fellow complex human beings. We need to be sad sometimes. Otherwise we're not recognizing or acknowledging the full range of human emotions. And, worse, we're not giving ourselves a chance to recognize or acknowledge them in others. I don't have much more to say about the film. It's the rare case where most of what I would say has already been said, and said well, by the film itself. But I'll leave you with this: I remember, about three years ago, this moment when all of a sudden I absolutely could not hide how sad I was anymore. I was driving in the car with a friend, a friend who is now a very close friend but who I barely knew at the time, and he asked me how I was doing. I seriously just unleashed on him. I don't really know why, but I was exhausted and hungry and sad and angry and just over everything. So I told him that. I told him everything. I cried. Like a lot. And you know what happened afterwards? Well, first I felt a whole lot better. I'd just been honest with him and with myself about how I was feeling for the first time in a very long time. I'd let myself be sad. But second, he didn't react by turning away or by trying to give me advice. Nope. He just told me he was sorry I was sad, and kind of left it at that. I remember that conversation now because it changed my idea of what it means to actually be a person full of joy and goodness. This friend is definitely someone I would consider full of joy and a very good man. But he didn't feel the need to cheer me up in that moment. He wasn't afraid of my sadness. Instead, he just sat in it with me. And that's what I needed. That's what we all need. And until someone did that with me, I don't think I was able to do that with others. So that's the value of sadness, for my count. The ability to face your own sorrow and the broken hearts of the people around you head on, without needing to fix it or make them feel better. To just sit in sorrow and let it be for a moment. That's why Inside Out is a good movie, and that's why you should probably really watch it. But more important, you should let yourself be sad sometimes. Weird as it sounds, you'll be much better off in the long run. Also, casting Lewis Black as the literal embodiment of anger is very clever. *Still terrified of them, just slightly less terrified than before. Slightly. **Probably because I have now cared for a small child obsessed with those movies for two years now, which means two years of "Lightning McQueen saved the day and hit the bad guys!" ad nauseum. So, I might be a little biased.